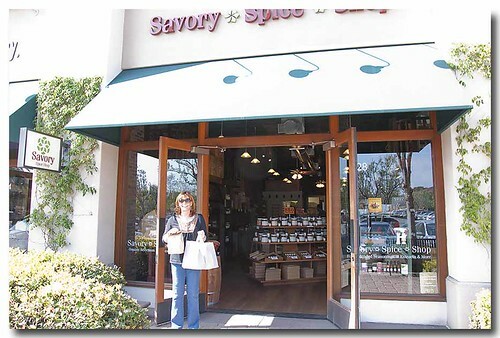 Last weekend Squeaks and I found a great little spice shop, Savory Spice Shop well, we didn't really find it, Squeaks' friend Lynn told us about it. We felt rather foolish considering it's been there for a year and we hadn't discoverd it yet. Our excuse, and I think it's a valid one, is that it's in the same shopping center as Sur la Table and once we are in the area we get tunnel vision and don't see anything else but Sur la Table. The big bag Squeaks is holding is hers and the little one, though packed to the max is mine. I'd say we found a few wonderful things in there. It's a very well stocked shop and there are testers for each spice and herb, tasting and testing is encouraged. Can't wait to go back and get more spices. Oh, and they ship, just make up your list and give them a call. Yep, Squeaks and I are at it again. This time we took a pasta making class, to hone our skills. This is the second class we took at Laguna Culinary Arts. Had this been the first class I've taken there, it would have been my last. That being said, I'm pretty sure I'll give them another chance but right now my disappointment is still very fresh. 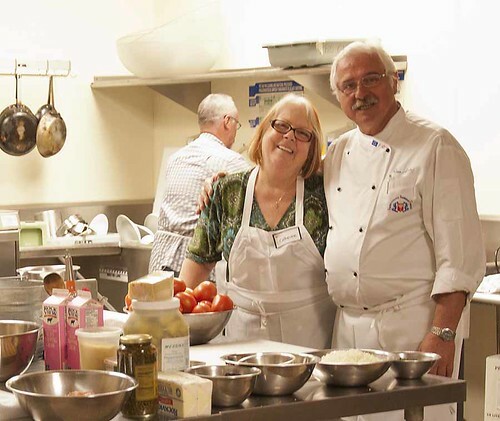 The class was taught by a guest chef Chef Rino Amato from Italy. Very nice personable man that did his absolute best under the circumstances. Some of my online foodie pals had a cook along this weekend. The theme was Tagine/Moroccan. 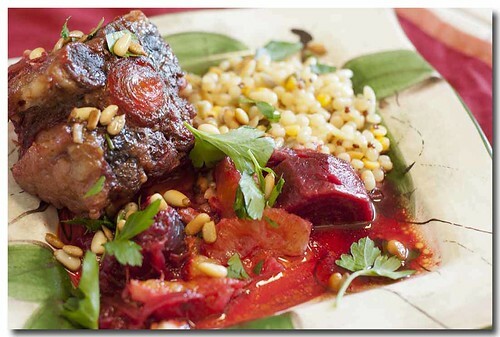 I'm fortunate enough to have a tagine, which I love, and had some oxtails in the freezer; Yippieee I was set. Having a tagine is not necessary, any heavy-bottom pot will do. Served with Harvest Grains Blend which is a mix of grains I get at Trader Joe's. Put on some Moroccan music and let's get cooking! When I'm stressed, I cook. And sometimes I end up with something wonderful like this. Leftover steak is a wonderful thing. 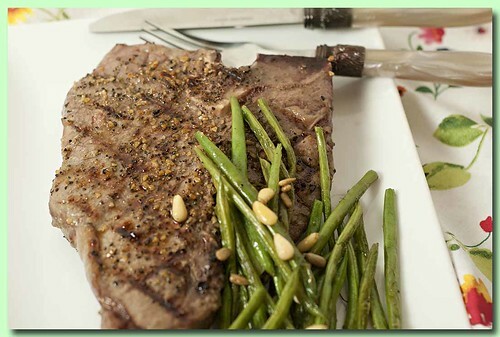 I know, some people have never heard of leftover steak but I just happened to have some. 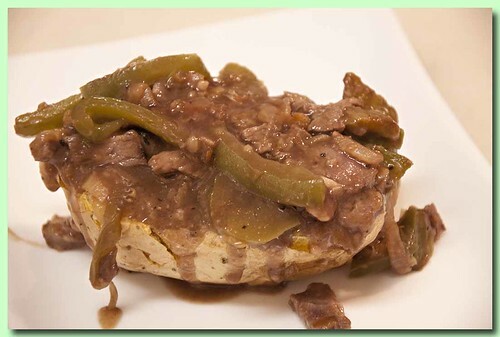 I had this meal of baked potato smothered with steak, onion and green peppers in a rich brown gravy. Last Sunday we had a potluck at church so I thought I'd take something kid friendly. A co-worker told me about when she was in elementary school, how she always looked forward to beanie weenie day in the cafeteria. 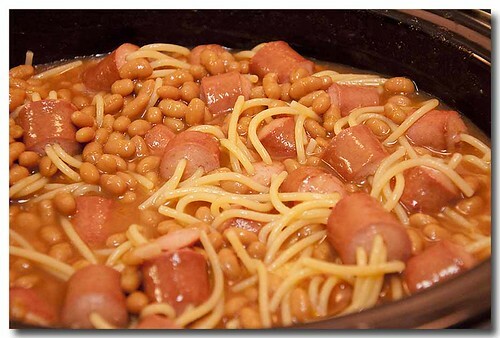 I thought I'd add the spaghetti trick to the hot dogs and call it Beanie Weenie Sketti. 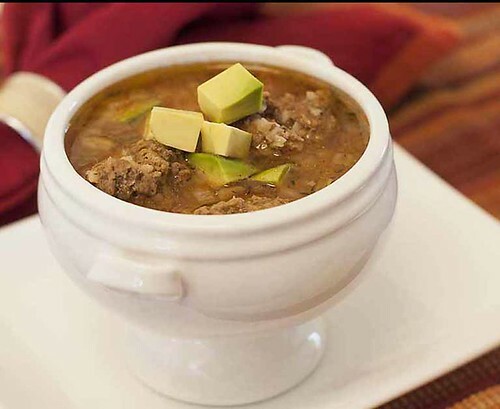 I like doing this around halloween and tell the kids there are spiders in the beans. It won't take long, lets make some. 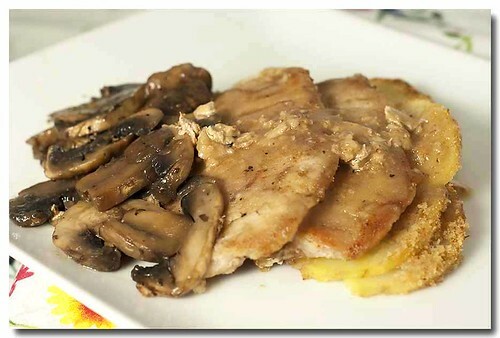 Using rice flour is a quick easy way to have golden chops without having to go through the flour-egg-batter routine. I served these beautiful chops with sautéed mushrooms, potatoes and a white wine reduction sauce. This is a Flickr badge showing items in a set called for blog. Make your own badge here.